As you walk in you feel like you have literally entered a different world, with it’s very own atmosphere. The walls are painted pink and the lighting is dim. The bar is a happening place, but the restaurant side offers a little more quiet. Although I hear brunch is pretty busy all the way through. If you are looking for white linen table clothes you will be disappointed. If you did come looking for good food, you are in for a treat. Burger and fries. It’s a great deal on the Happy Hour menu. Because Pink Rose really loves and does a great brunch, they also offer a few of those things on their dinner menu. There Happy Hour menu was a treat. 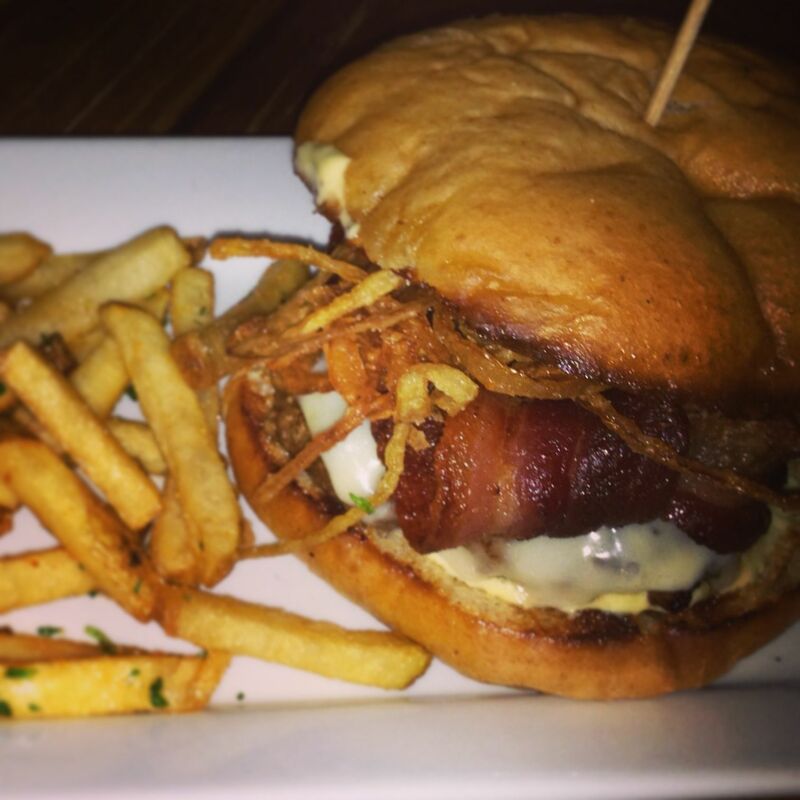 The burger with a dijon aioli, fried onions was a great deal at $8 and it came with fries. Of course you know me, I HAD to have the brussel sprouts and they didn’t disappoint. I had heard that the bacon wrapped dates were great, so I jumped on those too. 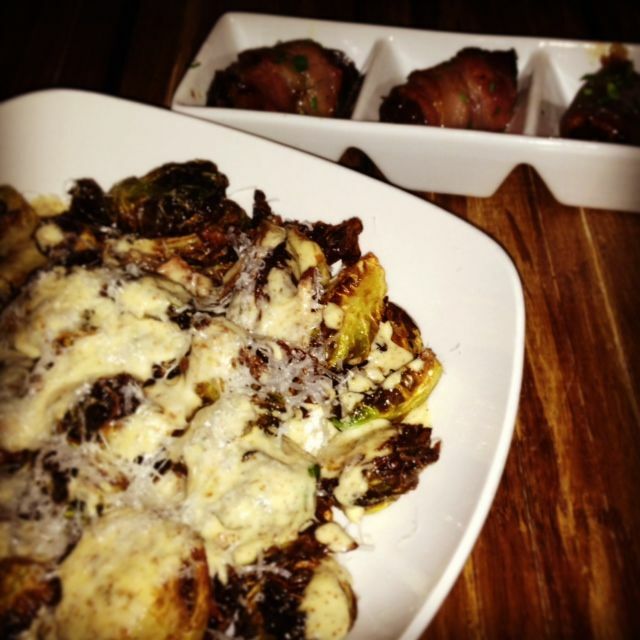 Brussel sprouts with a Dijon vinaigrette and bacon wrapped dates. I also heard great things about their drinks. So I told the bartender what kind of drink I liked and I asked him to surprise me. I ended up with something similar to a cosmo with pear infused vodka. They infuse their own vodkas, so they have quite a selection. My husband got The Gatsby, which is a house infused bourbon blend. They are really creative and it’s awesome. I did not get the veggie burger, but I was told by a reader and by the server that it was amazing. It’s made with fried green tomatoes. I might need to go back and see if what they all say is really true. That’s if I don’t go back for brunch first and order the fried green tomato eggs benedict. Speaking of brunch they offer 3 different kinds of eggs benedicts. pancakes, brussel sprout hash and chicken waffles, plus much more. You can wash all that down with bottomless mimosas. I will be back for brunch, that’s for sure. Atmosphere was that of an upscale bar. Even though it was hidden underground, they use that to their advantage. Service was great. They checked on us often. Pricing was very affordable. The most expensive dish on the menu is $12. Drinks were great with all their own creations and I love that they have Mac and Jack on tap. That’s a great beer that’s hard to find around town. 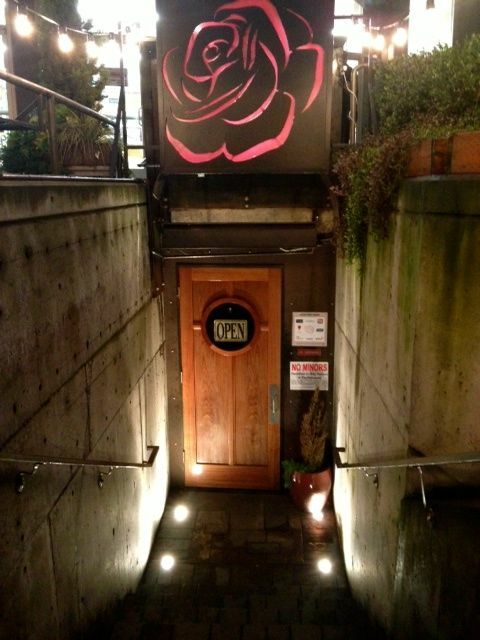 Pink Rose is located in the pearl, underneath Office Max. Click here for a 20% off coupon: Pink Rose Coupon.